All 112,000 tickets for this year's Glastonbury music festival were sold in less than three hours on Sunday - a record in the event's history. Fans rushed to snap up the tickets as soon as they became available online and over the telephone at 0900 BST. Organisers had vowed to improve the booking system, which saw many fans frustrated last year as the website crashed and phone lines jammed. They said on Sunday there had been no repeat of the problems this time. Gigi Dryer, head of Aloud.com - the festival's ticket agent - added that the ticket sale had been a "great success". "It has been the biggest and best planned exercise in live music event ticketing," she said. "Now we hope that those lucky enough to get tickets have the best festival ever." 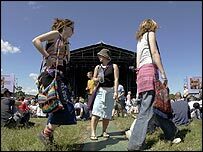 The 112,000 weekend tickets for the event at Pilton, Somerset, cost £125, with fans able to buy up to two each. A further 8,000 will be sold in the local area. 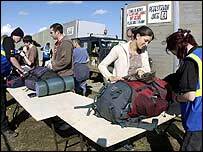 Organiser Michael Eavis said the ticket selling system had gone "like a dream" and beaten the five-hour target. "The move to selling the tickets on Sunday was a really good idea as we have the exchanges to ourselves," he said. "Selling the tickets in the day time was much better plan and people can now go and enjoy Sunday lunch and go to work tomorrow knowing they have or haven't got a ticket." Organisers spent a long time looking at ways to improve the booking system. Aloud.com designed a bespoke system with extra bandwidth and doubled the number of phone operators taking telephone ticket bookings to 100. Festival-goers will need to show photo ID, which will be matched with the name on their ticket, in an attempt to beat touts. The line-up for the event, to be held in Somerset from 24-26 June, will be unveiled on 1 June. But acts expected to appear include Kylie Minogue, Coldplay and the White Stripes. Last year, the BBC News website was inundated with e-mails from frustrated fans who were unable to buy tickets. They said the phone lines were constantly engaged and it was almost impossible to log on to the website. Around three million calls were logged on the day the tickets went on sale, with some 200 million redials. Was the ticketing system an improvement on last year's? If you wanted tickets, did you get them? If you did not get them, are you still going to try to get in? My daughter, son and friends had the families mobilised for a prompt 9am start, using BT broadband and standard internet, and mobile and landline phones, but all to no avail. Great disappointment. What did we do wrong? I got through the booking pages no problem at about 9.20am, but still haven't received my confirmation email (it's now 9pm, Monday the day after). Can't get through to aloud by phone, constantly engaged so i guess a lot of people are having trouble. I managed to put an order through for my friend too, and she got her confirmation email yesterday. VERY frustrating, aloud can't claim it was a success! My boyfriend and I managed to get tickets from India so something must work!! It worked like a dream for me: I got in to the website at the first attempt at 9:02 despite only having a single dial-up connection. If they sold almost 100,000 on the website in less than three hours then the website must have been working brilliantly - I'd be surprised if any other web ticketing system could achieve those results. Maybe those people who couldn't get through should have got up slightly earlier! Well i couldn't believe how easy it was for me to get my two tickets. I got up at 855, logged on with two computers, opened three tabs in each browser. i couldn't be bothered with the phone seeing as most the tickets were being sold online anyway, and i got through about 9.15 and bought my two. I called my dad and he was having no luck so he gave me his details and within 15mins I got through again and got his ticket. Totally painless, although far from perfect. I believe that the significant progress that has been made should be appreciated. No technical fix is going to solve the problem that 1 million+ people are after 100,000 tickets! However, max number of tickets could be limited to 4 per application to share things around a bit. Me, I'm watching it on the telly! Don't forget think of old John Peel when you are there - it won't be the same without him. How about a minute silence - or more appropriately a solid minute of noise for the old gent!? Got my ticket at 09:04. It was inevitable that people were going to be disappointed. It has been hyped so much this year by Radio 1 and other media sources. Ah, best check the tents still ok!!! See you all there!!! "If you are permanently living abroad, you can only buy tickets online, or by telephoning + 44 1159 934 163 using a CREDIT CARD." Really, I wish someone had bothered to tell the Aloud telephone staff and their supervisors this because they point blank refused to sell me a ticket using my credit card despite the fact that I do not live in the UK. I was a mug last year, 16 hours for nothing, and I'll not make the same mistake twice. What an absolute insult. All the major festivals have been getting busier over the past ten years and they're mostly full of the people that i go to festivals to avoid. The festival organisers have forgotten that they would be out of business without us punters, they better start getting it right, I'm going to smaller festivals now and there much, much better. I used to have the time of my life at Glasto and Reading, I'll miss them greatly. I am so happy - managed to secure two at 0930 - would have been completely gutted if I'd missed out. I feel your pain, people. However for those of you who did miss out - there may be a glimmer of hope yet - I know a few people who double booked so there are certain to be a some returns. Fingers crossed a few of you will get lucky!!! I do think some of you are being a bit hard on the system - lets face it - it was a world apart from last year's joke. I think you can blame the telephone exchanges and ISPs as much as anything else for your chances of getting through on the internet. I live in Exeter and have been fortunate in getting tickets for both 2004 and 05 whilst other friends kept getting bounced. Hence if you want tickets get out of London and the big cities and head to Devon. Thank Eavis for providing once more the best festival on the planet. Between my friend and I we manned three phones and 10 browser windows. After 45 minutes of nothing apart from irritation over an engaged tone and RSI from repeatedly refreshing the pages, suddenly several booking forms opened up. Wahey! I then bought tickets for someone else as they couldn't get through online and I felt guilty about this. I managed to get two tickets at 9.08, and it all went smoothly - I was very nervous after what happened last year (even though I did get 4 after 9 hours!). I really think this is the fairest way to get tickets, as if you're determined enough you will keep trying and it's that that works. Keep it up, Eavis'!!! Last year I managed to order through the International number at about 1 am. This year I got through online at the very first attempt... could only have been a minute after 9. The email then arrived at 9:18. Clearly I was one of the lucky ones...but in answer to someone's question 'Did anyone get tickets in Wales?'... yup I did and so did all my pals. Ah... Glastonbury. I'd like to see a breakdown of where the people who DID get tickets live. For the second year running all the people in our Glastonbury-circle were totally unable to get a ticket between them. We have all been going for many years, and have been unable to even get onto the site despite 10 people constantly trying while the lines were open. None of us live in big cities - is there easier access to the lines from some places? The system is a total lottery, could be organised in a much fairer way i.e. ID produced at point of sale and no transfers - as tickets ARE up for resale and I can't believe the stewards on the gate on the day will be turning people away at the festival - I've seen them let ticketless people in if they begged hard enough in the past. Totally, utterly devastated at the reports that this year has been a 'success' regarding the ticket sales- can't bear going through all that angst again I fear. Thank you Mr Eavis/Emily/Aloud.com. I was gutted when I spent the whole day trying last year, only for them to sell out and had to make do with the BBC'S version. Got my 2 tickets at 9.15 on Sunday. Well worth missing my Sunday morning lie in for(although I was very surprised). It's made my April, and can't wait for June. We used 2 mobiles and one landline to no avail but I got through at about 10.20 using I.E. on Broadband connection, booked two for me and two for a mate seemed very random!? Confirmation arrived 9hrs later and my mate is still waiting. Better than last year's sleepless 14hr exercise but I wouldn't say it was a total success given the messages here. Lottery for tix not a good idea, you need to put some effort in to deserve going to Glasto! What all these comments show is how hit and miss the whole process is. Far too much depends on what technology you have access to which isn't really in the spirit of Glastonbury is it? It's difficult to know what the alternative would be other than releasing batches of tickets over a longer period maybe and make it phone sales only. The system was a success in my view. I can't understand why all these people who haven't got tickets are blaming the system, basically there are more people than there are tickets, so some people are going to be disappointed. If everyone tries to log onto the website, or ring up at the same time unless they have 100,00 phone operators of course you're going to have to compete with others to get through. The system obviously worked as the tickets were sold quicker. The only thing I'm concerned about is what they are going to do with cancelled orders, duplicates and returns, there doesn't seem to be any plans for another release of these spares, so who is going to get them? Got 2 tickets with no problems at about 9.02 via the web using Firefox browser - couldn't believe my luck as I was expecting to be hitting the F5 key for an hour or two. About an hour and a half later I tried for some friends and had no joy whatsoever with Internet Explorer, then I tried again with Firefox and got a booking form immediately and the page was loading live, not from a cache - very strange indeed. Didn't manage to get the second pair of tickets though as they sold out while I was trying to get hold of their addresses, gutting ! We had two phones, and 4 web windows open from 9 and we got tickets. we refreshed the page as soon as the sale went through the website said the tickets had sold out!! By the skin of our teeth. And that was as 11am. Yes! I've got a ticket! After trying for 24 hours nearly non-stop last year (with no success) I was dubious about how well the new system would work this year. I teamed up with a friend, and we were trying to get tickets for each other - me on the phone and him online. I was pressing dial, heard the engaged tone, cancel, redial every 20 seconds on two mobile phones (one in each hand) for two and a half hours non stop, until I finally got a call from my friend who got through online. We weren't certain though until the confirmation email came through this morning. An improvement, but still not a perfect system. Can't wait to be there though! Only live a mile from the site and couldn't get a ticket!! Tried in vain from 9.00am until 10.30am by phone and internet, then decided not to waste anymore of my valuable time to a lost cause. (wasted too much time last year!). Only fair way is to take everyone's details well in advance and allocate tickets at random. From my point of view, nothing has changed since last year and Aloud and Mr Eavis should not claim success!!! Hopefully they now have 2 years to get it right! After an hour of constantly pressing 'Refresh' - my kind friends called to give me a better link that they had got their tickets through obtained through a real community spirit of everyone we knew who wanted to go calling each other with advice and help. I got them straight away after that and then helped a few more people get their tickets. Beats the 12 hours it took me last year!! Yesterday, as ever, was one of the most stressful days of the year. The waiting the clicking, the not knowing. We thought we had ordered two tickets at 10.26am but didn't know for sure until 22.58pm, despite three phone calls to Aloud to see if we had them or not, they could not tell us either way. It's always going to be a shambles but it was better than last year by far. I feel for the people that missed out on the best festival in the world! A success? From reading the other emails it seems most tickets were sold in the first hour, confirming my suspicions that most of us were wasting our time. Despite being logged on from 9am and with my mobile and landline on constant redial, I got nowhere. Neither did anyone else I know. The only way I knew they'd all been sold was when Radio 1 announced it. How is it possible (or fair) that 1 person managed to buy 16 tickets for all of his friends? Surely it would make things fairer if it was only possible to buy up to 2 tickets per household? As my IT friends always tell me, putting in bigger servers and faster computers simply speeds up a process and will not fix it. I got my tickets dead easy, but I can still see the flaws with the system. It looks like the only way forward is some sort of lottery. At least everyone has an equal chance that way. The only improvement on last year was that it all sold out in 3 hours so at least people weren't trying hopelessly for 24 hours to get a ticket. We had 2 phones on the go and 2 high speed internet connections - no luck. On 2 occasions we got through to the booking page, entered our details and then got an error message. The same thing happened to my friend. So the system didn't crash, eh? The mad thing is, my other mates all got tickets fairly easily and in the end got our tickets for us - hooray! I don't understand how some people can get through to the web site quite easily about 6 times, whilst others can't get through at all. Did anyone manage to book tickets in Wales? This year was the first time I was trying to get tickets, I was online at 9.20 and by 9.45, It went through! Sunday is my only day off and I had to be at the office at 9 again... I would have been very frustrated not to get them! I think the efficiency of the broadband makes the difference, or I've been extremely lucky! Got through to enter my card details after about 1.5 hours. Nothing happened when I hit the submit order button apart from a small error in the bottom left of the browser window saying 'Error on Page'. The site undoubtedly held up much better against the sheer volume of hits, but I think Aloud could have worked much harder on basic browser compatibility testing. I managed to get tickets online at about 10am but found the only way to access the order form was to refresh the page which said 'server busy', refreshing the other page did nothing. Had to wait a stressful 8 hours for my email confirmation and I was convinced that the order hadn't gone through. I phoned the helpline several times in the afternoon, they were very friendly but couldn't help me because they had no information about the internet bookings, it all seemed a bit chaotic. It's a shame that many people couldn't get tickets, I was really desperate to go again this year and I'm sure many thousands felt the same but are disappointed today. Glasto's unique! Still haven't got my confirmation email :o( I managed to order tickets on the web at 10.30am yesterday and got the confirmation page, but the email still hasn't arrived....anyone else still waiting?? I still feel this year was a shambles - I kept getting the same telephone message saying how there was high demand for this number. There were 3 occasions where all I got was a technical difficulties page and I don't know how many pages say the service was, but in the end all was well and tickets were bought - which is the only consolation for last year's fruitless frustration. Woo-hoo Glastonbury 2005 here I come! I'd given up sorting Glastonbury after going through huge hassles getting tickets last year and failing. I just happened to be browsing BBC news on Sunday morning at about 10:00 when I saw the news item about tickets on sale. Not expecting success I thought I'd give it a go and after one try I was sorted for two. Mind you it was a bit nerve-wracking waiting for the confirmation email. As a first timer I can't wait! Having missed out last year I can fully understand how gutted people who haven't got tickets are, but it has to be said, a much improved system. This makes up for missing out last year. Roll on Glasto 2005! I tried solidly for 3 hours to get through on 2 engaged phones and by constantly refreshing the busy web page. It's quite annoying to hear the organisers gloating about how well the system worked this year - no it didn't! Anyway hope you all have a good time and next year I'll hopefully see you there. It was a joke. I phoned constantly for 5 hours and had 6 computers on the go. I got timed out every time, and a constant engaged tone. I had friends who managed to get 8 tickets using the same web connection in the London area but i don't know anyone in Oxford lucky enough to get a ticket. Bit mixed I think. I got tickets, as did some of my mates, but others didn't. What is really needed is a proper worthy mudfest to reduce the current demand for tickets. It may look fun-packed on tv but in reality it's a mare! I am dead chuffed! This year I got a pair of tickets within an hour... last year I got my ticket after 22 hours of constantly trying! Once I got through to the main ticket purchasing page (from a link displayed on one of the many web fora I surfed in tandem!) I got my information through first time and was amazed to get an immediate confirmation page! My only criticism would be that my confirmation email didn't arrive until the evening so I couldn't be 100% sure and celebrate. Having said that, what an improvement on the system used for Glasto 2004! OK do the Math everyone, 112,000 tickets available, 7.5 million hits on a website, 2 million attempted phonecalls, there were bound to be lucky ones but there were always going to be unlucky ones. In my case I got tickets at 10.30am and felt like I'd won the lottery...what will we all do for excitement next year when there will be no Glasto?! No repeat of the problems this time? Well, maybe true if last time's problems weren't jammed phone lines and a non-working website. I spent 2.5 hrs on aloud.com hitting refresh and my girlfriend spent the same time on the phone pressing redial. I actually got to type in my card details, but after submitting them got the all-too-familiar "server not found". Sometimes the monotony was relieved with new messages such as "service unavailable". Not exactly angry at not getting a ticket, it was always a long shot, but I am angry at the organisers claiming it all went smoothly. I managed to order by 9:15, and got the confirmation email 4 hours later- all very efficient and shiny. But when I checked my emails this morning I received a message from the ticket seller, sent at 9:20pm saying that they had not been able to extract payment from my debit card (which I know had enough money on it) and had cancelled my order! Gutted. I feel quite ashamed to say that I put almost no effort into the purchasing the tickets this year but a friend came up trumps with a little trick about removing the http:// before the address of the order form and purchased tickets in about 2 minutes, technically this should make no difference but it definitely did because as soon as I had mine so did all my friends using the same method. Good job, Aloud. Very painless and smooth. And if the anti-touting measures work, we'll have nothing to complain about this year. Unless it rains. Glastonbury festival is one of the largest in the world and we seem to forget what a mammoth task it must be organise - ticket sales and otherwise. This year's ticket sales were 100% better than last year's with no 15 hour phone/internet vigil(it took us 1 hr this time). Praise must go to everyone who helps out and we should be thankful that Glasters is around at all! What a dream! The service is obviously improved as I don't know anyone who experienced pages crashing halfway through an order like last year, but I really think it's down to luck whether you get through or not. and there will always be more people wanting to go than there are tickets available. Someone will always lose out. We had 3pc's on the go. Two couldn't get through to the booking page at all and when the third finally did the 'click to order' page would not load. The phone was also constantly engaged. Not happy at all! I managed to get myself and many of my friends tickets, but only because I was part of a community of Glastonbury fans who were sharing direct links to the order pages. I was regularly testing the appropriate methods and found the phonelines to be constantly engaged, and the webpages slow or not loading up. It may have gone better than last year, but I still think its a nightmare for most. I wouldn't call it a success, but a slight improvement. I don't think that the system could be improved much further. Demand will always outstrip supply so the best we can hope for is to find out whether or not we have been lucky as quickly as possible. Yesterday's 3 hours to find out either way sure beats spending a whole day on the phone with still no guarantee of success. Wow - I think I must have sussed the rather hidden link to the booking form before most got there. After having to resort to eBay last year, had this year's ticket in the bag at 9.06am at my first attempt (won't believe it till it's there in my mitts though). Pure luck, I'm sure and after last year know how those who didn't get through must be feeling. Quality system, got tickets by 9.15am. The website was extremely well designed and load-handled. I managed to get tickets after about 90 minutes of persistence - 6 windows open on my broadband connection and constant redials. Before this, I had various different 'server busy' or 'the page could not be found messages'. Then when I tried to buy for a friend with a slower internet connection, I got to the booking page - but after filling in the details the server wouldn't take the order - this happened three or four times, and I couldn't get him a ticket. Trying to get through on the phones was hopeless. It was clearly a bit more efficient than last year (and I'm very happy to have got my tickets) but I certainly don't think Aloud.com and Eavis are entitled to claim it was the triumph they are making out. The phone lines were a nightmare, and I'm guessing the internet took the majority of bookings. I wish it hadn't said 4 hours for confirmation. It took us 10!!! Thankfully we did GET a confirmation and it was successful. How on earth could anyone say the system worked well? It was the same shambles as last year only with a shorter time span. Engaged tone for 3 hours, various error messages from the website, no tickets.. Yeah, the new system seems fine to me. Four of us had been planning the trip and one got a ticket, 2 tickets per person is ridiculous when one person could give identification details of the rest of their party. Balls! By about ten past nine all the details were in and we had our tickets. No probs for us. 3 phones and 1 broadband connection equalled no luck for us and depression kicking in. Seems there were less problems this year than last yet I got tickets relatively easily last year but didn't this, so a tad ironic! Can't believe I am going to miss the festival! System better? I'll say no comment on that. After a 24hr fiasco last year, was very pleasantly surprised to get in online at 09:13 and order three pairs of tickets in a row (for everyone in our house) - website was speedy and the confirmation email arrived at 1:00pm. The difference seems to be website stability - once able to access the site, the process was stable and didn't hang or collapse mid-way through the booking as it did last year. I guess they were only allowing a certain number of connections to the booking server at a time. I was delighted to get two tickets by about 9.15am. However, the friends we were supposed to go with are ticketless despite trying until the sell-out announcement. If we'd been able to buy theirs as well as ours, it would have been a lot easier and freed up a few phone lines... after all, the tickets require ID anyway to prevent fraud etc. We'll miss our friends' presence at the festival. If they had a 100 phone operators and each transaction took say 2 minutes then the max tickets that could have been sold in the 2 hours sellout is 6000 out of 112,000 or less than 5%. So the crowd this year at Glasto will be folk who are up at 9am on a Sunday morning with a fast broadband connection and a credit card with a good bank balance on it. Last year I had to wait six weeks until we found tickets on resale. So this year I was well chuffed that after 5 mins I had 2 tickets to the best festival in the world. However the shock of getting through so quickly freaked me out and I wondered if I had entered my details correctly. I still have no confirmation yet but they say it's confirmed. I really feel for those who can't come this year but I will have a great time for you. Thanks, Mr Eavis. I tried for three hours using two phones, averaging 15 - 17 dials per minute and got nothing other than engaged. Don't know what I could have done differently. Frustrating. Hard to know what more they could have done this year. But then, I did get my tickets at 9.12am. People who got tickets are praising the new system and those who didn't are slating it... which is completely understandable. This is the first year I tried to get tickets and after constantly getting an engaged tone on the phone lines and unavailable web pages I got through! Managed to get my tickets just before 9.30am but then the wait to receive e-mail confirmation nearly became unbearable! I'm so excited now and can't wait to get my wellies on and experience the mud of Glastonbury!! I had two phones on the go and four browser windows open from 9am. The phones were blocked at the exchange to high volume and the browsers kept timing out at various points. I finally completed a sale at about 10am but so far no confirmation email has arrived and the helpline is not being answered - I still don't know if I am going!!! Seemed to be much better than last year but success seemed to be based on how good your ISP was. I managed to buy 16 tickets without a problem on behalf of various friend who could not get through with their own internet connections. Oddly enough, I didn't manage to buy a single ticket using Internet Explorer but managed without a problem when using Mozilla Firefox. Don't think this was coincidence as I was trying with both browsers at the same time and IE was not working but Firefox was. After the shambles of last year yesterday was a great success, I know there are still disappointed people, but there is no way of avoiding that. What a superb tribute to the thousands of, mostly voluntary, workers that make the festival happen each year. Although I appreciate that this is the fairest system and that it's pure bitterness that leads me to writing this, I do take exception to the notion that the website wasn't crashing. I filled in my credit card details on about 12 different occasions and the server was too busy to take my order to the confirmation screen. Gutted I'm not going to be there. C'est La Vie. Such a difference from last year - We had four or five windows open on screen and we got tickets in less than 20 minutes. The easiest gig/festival I've ever got tickets for! After trying to get tickets for the last couple of years and spending 24 hours solid trying to get them last year (only to be bitterly disappointed) I finally managed it this year! I was trying from 9am and eventually got through on line at 10.40am. The telephone system was constantly engaged throughout this time. Not sure if me being successful was down to an improvement of the system or just pure luck. Either way I'm happy! I thought it was rubbish, we tried on four phone lines and had two of us trying on the website and never got through. I don't think it was greatly improved from other years at all as we got tickets two years ago within an hour with no problems!! I can't understand how other people got through as we were all prepared well in advance. I checked the website everyday for two weeks and was ready to get tickets way before 9am. I am extremely unhappy!!! I don't understand how it has improved. I was calling constantly as well as logging onto aloud for two hours and still had no joy! Why is that? Compared to last year ( over 16 hours waiting!) this was a dream! Was able to order over the net after an hour, although I know some people who still didn't get a ticket. Well done Aloud.com! 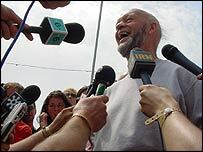 I'm surprised that Michael Eavis thinks yesterday went well & the system coped. Not from our end it didn't. We had 2 laptops, a house phone & 2 mobiles on the go & didn't get anywhere near. We go every year, regardless of who is appearing, & this year it would have been the only thing to brighten up what has so far been a very bad 2005. For a good couple of hours all our laptops got was a page saying 'The service is busy, please try again later'. I also fail to see how we could not have got through on the phone. The organisers deserve praise for the way they handled ticket sales for this years festival. After last years fiasco I feared the worst but managed to secure tickets within 20 minutes rather than the three hours it took me last year.